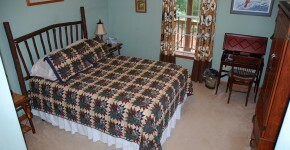 The main lodge was built in 2006 as a B&B inn with features we liked about B&Bs where we have stayed. 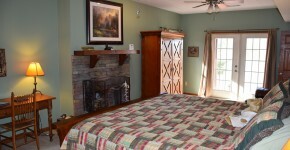 We incorporated our love of the Adirondack style including a two-story stone wood burning fireplace in the great room. 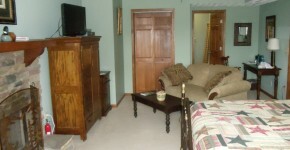 There are two rooms on each of the three levels and no rooms share a common wall. 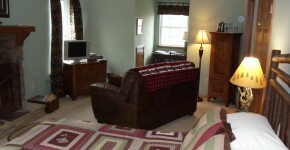 Five of the rooms have wood burning fireplaces and jetted garden tubs. 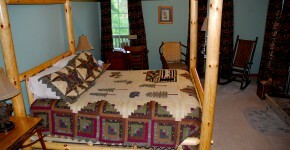 Enjoy great mountain views to the west from every room and our wrap-around porch. A full three-course breakfast is served to guests in the main lodge. A wide variety of juices, hot or cold fruit dish, a from-scratch pastry and a main dish such as egg puffs, sausage and home fried potatoes or blueberry pancakes is served each morning. 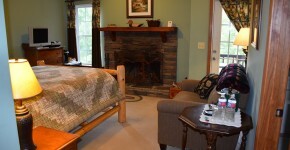 In addition to our dining room we have a very large screened-in porch for breakfast dining much of the year. As long-time antique and book dealers we also have rare book shop in the lodge.